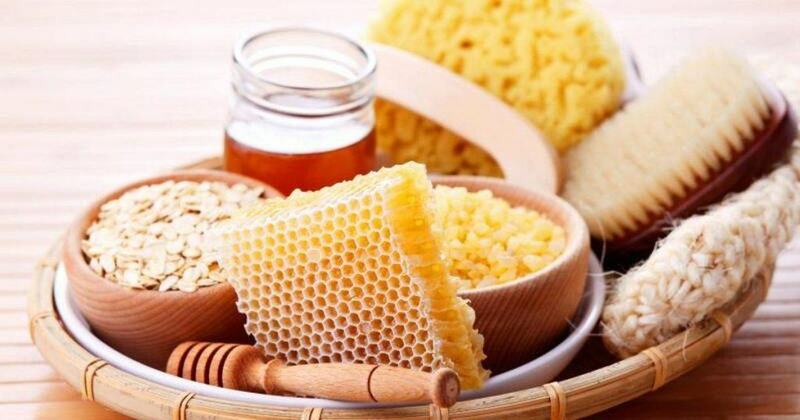 Honey, propolis and bee venom are three top products when it comes to skin care. They reduce wrinkles,stimulate collagen production, prevent acne, pimples and redness and help to promote healing of skin. Honey is a great assistant for eczema, acne, psoriasis, dermatitis, and even for healing. It hydrates and nourishes the skin. Bee venom, secretions of bees, stimulates skin cells regeneration, increases collagen production, smooths wrinkles and reduces redness. It is often referred to as natural Botox because it stimulates collagen production. However, those allergic to bee stings should avoid it. Propolis is rich in antioxidants, destroys bacteria, and prevents acne and redness. Let’s keep to the honey benefits. Honey is rich in sugars, vitamins B1, B2, B6 and vitamin C and tannins which soothe sensitive skin. It is widely used in cosmetic products because of its ability to attract and retain moisture in the skin. Honey acts as an anti-wrinkle cream because it hydrates and heals cracked and dehydrated skin, and we all know that dehydration is one of the biggest reasons for the appearance of wrinkles It gently nourishes the skin, improves blood circulation and makes your skin soft. You can beautify your skin with a honey face wash. In half a liter warm water put one tablespoon of honey and mix them together. Use this water to wash your face before sleeping and rinse with lukewarm water. You can repeat this every night. Honey fights against acne. To prepare this face mask you should put three tablespoons of honey and a teaspoon of cinnamon in a bowl, mix and then apply the mixture on your face. Leave it on for 15 minutes and rinse with warm water. Repeat every week for best results. Honey’s antibacterial and anti-inflammatory properties make it an excellent tool in the treatment of wounds. It speeds healing, and scars are smaller. Whenever you have a wound, all you have to do is to apply a little quantity of honey on it, and you’re done. Honey protects skin from the harmful sun rays due to its richness in antioxidants and successfully restores the skin damage. It has antibacterial properties, absorbs impurities from the pores and prevents skin lipid and thus the occurrence of acne. Honey is perfect when it comes to treating a dry and damaged hair due to its amino acids. In addition, honey makes the hair smooth due to the sugar it contains and the tannins provide a natural glow. It functions as a mild antibacterial, ideal for colored hair and scalp that has problems with dandruff. To prepare this hair mask you will need a spoonful of honey, a liter of water and a few drops of lemon. Put all the ingredients in a bowl and mix them together. Apply this mixture to your hair and leave on for 15-20 minutes. Afterwards, rinse with warm water, and shampoo. Your hair will be great! Having chapped lips is horrible. They hurt and look unattractive. Therefore, you should heal the skin of your lips with this mixture. Mix a teaspoon of honey and cheese. Apply to lips and let it dry for 10 minutes. Afterwards, rinse with warm water and put some hydrating lip balm.